Montclair State University researchers Michael Esposito and William Davis at an observation of Wood Badge. 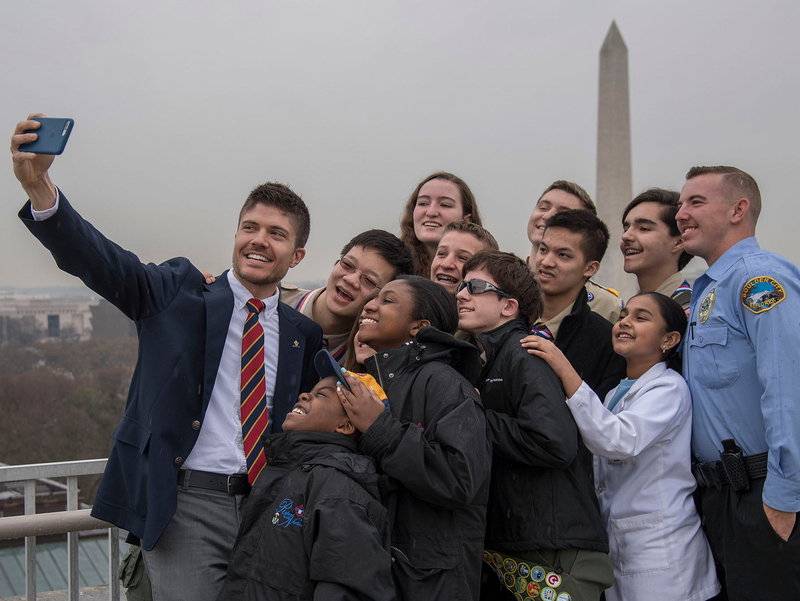 A first-of-its-kind nationwide study will examine how Scouts and adult leaders work together and reveal ways the BSA can better support its adult volunteers as they deliver on the promise of Scouting. Put simply, the results will help the BSA help you do your best. Or: BEST. As part of the Building Evidence in Scouting Together (BEST) study, researchers from Montclair State University and the American Institutes for Research will spend 2019 and 2020 surveying 2,500 troops from across the U.S., talking to Scouts and adult leaders by telephone, and observing adult leader training courses like Wood Badge. The team, led by Jennifer Urban and Miriam Linver at Montclair State University and Deborah Moroney at American Institutes for Research, will release findings as they’re available, with the first report expected in summer 2019. While the BSA has approved and sanctioned the project, this study will be completed by independent researchers. As I first reported last year, money for the research comes from a generous $5.7 million grant from the S.D. Bechtel, Jr. Foundation. MSU researchers Jennifer Urban (left) and Miriam Linver. Montclair State researchers randomly selected 2,500 troops. The troops represent a geographically diverse cross-section of the BSA. Because self-selection might skew the results, there’s no way to opt-in. If your troop is selected, you’ve either already heard from the researchers or will soon. Watch your email inbox for a message from YourVoice@BSABESTstudy.org. If you deleted the email or didn’t receive it, don’t worry. They’ll send follow-ups to the sample group. Researchers will confirm they have the right contact information for your troop’s Scoutmaster. The Scoutmaster will receive a digital “key” to unlock online access. All who are interested will complete a 20- to 30-minute online survey at three different time points between now and April 2020. The first survey window closes in May 2019. Each time Scouts or adults complete a survey, they’ll get one-third of an exclusive patch available only for BEST study participants. A small group of people also will be invited to participate in three telephone interviews between early 2019 and spring 2020. Did I mention the patch? Yes, but it’s worth reiterating. Everyone who participates will get one piece of a three-segment patch. Complete all three surveys, and the complete patch is yours. Additionally, the troop can receive up to $100 in Scout shop gift cards. The troop receives a $25 gift card for registering and another $25 at each of the three survey points if they get 50 percent or more of Scouts to participate. MSU researcher Yolanta Kornak-Bozza sets up her tent at Wood Badge. This is not a comparison study. It’s not comparing the BSA to another youth-serving organization or after-school activity. (The 2015 Tufts study already did that.). The BEST study will determine what makes a successful adult leader by examining the ways adults and Scouts work together. Does it matter which trainings you go to? What about when you take those trainings? Does it make a difference if you were a Scout yourself as a kid? What are the profiles of successful leaders? What is “success” within the context of Scouting? “We’re trying to understand what those answers are, so BSA as an organization can be even more deliberate,” Urban says. In addition to online surveys and phone interviews, the BEST team has sent Wood Badge-trained researchers to observe BSA position-specific training courses and Wood Badge weekends. To see more, including a comprehensive list of FAQs, visit the official study website.